Well we'd heard about it and heard about it and reported on it (then other people reported on it), but the buzz around the Apple Store in downtown Spokane has a glassy finality to it. On the plywood facade erected around the old Eddie Bauer location (710 W. Main Ave.), the computer and lifestyle corporation has finally branded itself. No official date has been set for the launch. Several friends and acquaintances of The Inlander have been interviewed for positions at the new store, which is a good sign, though a peep in an open door last week showed an interior that was still really rough. 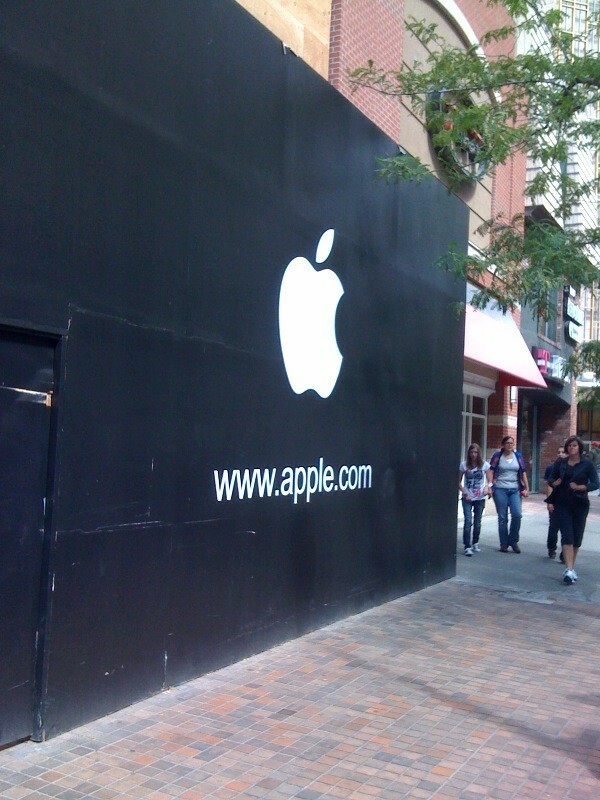 Given the company's mostly impeccable control of buzz and consumer demand of its products (love the iPhone/iPad/iPod or hate them, Apple is invariably seen as the company to beat in smartphones/tablets/mp3 players), we're going to wager a guess that the Apple Store will be open in time for Black Friday. Anyone gotten hired there yet? Email me at luke[at]inlander[dot]com.